Well, we knew it was bad, but now thousands of consumers surveyed by the University of Michigan for its annual American Customer Satisfaction Index (ASCI) are saying airline customer service is the worst since 2001, and at its second lowest level in the survey’s 13-year history. The ASCI ranked American, Continental, Delta, Northwest, Southwest, United, and US Airways individually, assigning each a score on a 100-point scale. The other U.S. carriers were lumped together. US Airways and United ranked last (54) and second-to-last (56) in customer satisfaction this year (no big surprise), while American (62) got the highest score of all the traditional six legacy airlines, actually improving its year-over-year score by a couple points. The ASCI press release noted that the survey was conducted before American’s nightmare flurry of maintenance-related cancellations in April. I’m sure American’s ranking would be lower today, as I know a number of American cancellation victims who’ve since turned on their one-time “least-worst” carrier of choice. Continental (62), the top-ranked legacy airline seven years in a row, tied with American, but its score reflects a 10 percent drop in customer satisfaction over last year. Business Professor Claes Fornell, who is director of the center that compiled the ASCI, told the Associated Press that the 2008 survey showed “really dismal numbers … There’s no other industry anywhere that has so many basic mishaps in terms of not delivering the basics. They’re supposed to deliver passengers with their luggage to a particular destination within a certain time frame, and they frequently fail to do that.” However, Fornell noted part of the airlines’ problem is that most customers make their purchasing decisions based on price, not quality. “The result of that is very low service and a business model of cost-cutting that really leaves no one happy, certainly not the businesses, the shareholders or the flying public,” he said. What do you think? 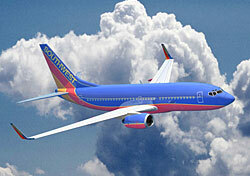 Is Southwest the airline industry’s knight in shining armor?